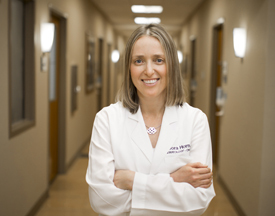 Leora Horn, M.D., M.Sc., associate professor of Medicine and clinical director of the Thoracic Oncology Program at Vanderbilt-Ingram Cancer Center (VICC), has been selected to lead a clinical research trial of combination therapy using two targeted drugs for the treatment of a specific form of lung cancer. The Phase 1/2 trial will test the drugs afatanib and necitumumab used in combination for patients whose non-small cell lung cancer (NSCLC) tumors show mutations in the epidermal growth factor receptor (EGFR) gene. Both of these targeted therapies are approved for use in NSCLC, and this combination therapy trial is for patients whose cancer has already become resistant to other EGFR therapies. Horn is one of three investigators selected to lead clinical research trials of combination therapies for patients with EGFR-positive cancers. The National Comprehensive Cancer Network (NCCN) Oncology Research Program (ORP) has funded the three studies in its first multi-industry collaborative research project, in which Boehringer Ingelheim Pharmaceuticals,Inc. and Eli Lilly and Co. are working with NCCN to study combination therapeutic agents in lung cancer and head and neck cancers. Boehringer Ingelheim awarded the program a $2 million research grant to support NCCN investigator-initiated studies of combination therapies containing Boehringer Ingelheim’s afatinib for the treatment of lung and head and neck cancers. NCCN and Boehringer Ingelheim collaborated with Lilly for access to the drug necitumumab. Submissions were peer reviewed by the NCCN Afatinib Combination Scientific Review Committee and the funded concepts were selected based on scientific merit, existing data and the types of studies necessary to further evaluate the efficacy of afatinib. “New targeted therapies have improved survival for many patients with stage IV non-small cell lung cancer, and we have been active in clinical trials that have led to approval of new drugs for patients with specific tumor mutations like EGFR,” Horn said. Phase 1/2 trials are designed to determine appropriate and safe dosages of the therapies and to look for signals of activity. Later stage trials determine whether the therapy being tested is more effective than current standard of care. NCCN is a not-for-profit alliance of 27 of the world’s leading cancer centers, including VICC, which are devoted to patient care, research and education. NCCN promotes continuous quality improvement and creates clinical practice guidelines appropriate for use by patients, clinicians and other health care decision makers.